Home Automobiles New BRABUS 850 XL Available Now based on Mercedes-Benz GLS Version. New BRABUS 850 XL Available Now based on Mercedes-Benz GLS Version. The New SUV is out from Brabus! Now this company has redefined the word Super SUV with the creation of the new Monster Brabus SUV 850 XL based on the Mercedes-Benz GLS. The Luxury SUV with 625 kW / 850 HP, 1,450 Nm of torque with the top speed of 300 km/h and 23-inch forged wheels. This new Brabus Mercedes GLS 850 XL is powerful, and massive family bus which is regardless of the practical matters are concerned. This SUV is completely different and awesome in all aspects. 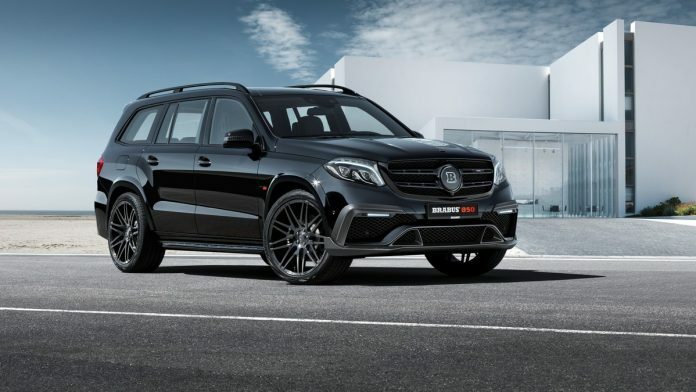 This Brabus Mercedes GLS 850 XL is the twin turbo with the eight-cylinder AMG engine. This Brabus is modified and upped to six liters and modified heavily; it doesn’t even looks like and resembles the standard unit. The car comes with mind-boggling peak torque of 1,450 Nm, and 850 horsepower leads to the result of the engineering work. This car can attain the speed from 0 to 100 Km/h in the time of 4.2 seconds, and the top speed of the car is 300 km/h which is 186 mph. When you want to go with this car, definitely you don’t need this much power and speed in your routine life. But you need the looks for this SUV which you use this car for School run and taking your kids to parks, training, etc. Brabus Mercedes GLS 850 XL will need satisfies the customers. This SUV car arrives with the naked carbon fiber aero kit. The other features include in this model is a massive front spoiler, side skirts, Brabus grille, fender flares and rear diffuser with integrated matte black tailpipes. There is the 23-inch trailer which is made for BRABUS Monoblock “PLATINUM EDITION” hi-tech forged wheels, and this gives the GLS and makes this to look like the Super Car.